You will probably find easily a job in Switzerland, faster than you ever thought, and better paid than you ever expected, however not everything is as perfect as you planned. The life in the land with one of the worlds highest GDPs isn’t bad at all, with a minimum full time salary (living alone), I can still save a little and have travelled more than I had ever. 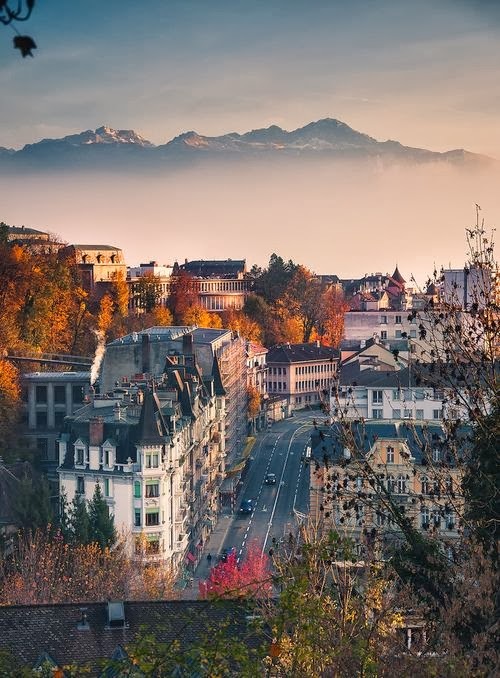 Plus, pretty picture perfect Switzerland will offer beautiful lakes to go swim in summer and the coolest view ever from the top of mountains to go ski in winter. 1. The panorama is very Swiss and true of everything good you heard of; however the population is a wide range of different cultures. 2. If you a foreigner- Finding an apartment is hard and takes time. Consider a month or two. They will ask for you migration papers, papers of the time you left your country and when you got to Switzerland, working contract, etc..
3. If you are a Swiss citizen- things might get easier, but it’s still hard and time consuming. Swiss people trust more to live amongst their own. 4. Swiss hate germans and germans think swiss people are “cute“. And if you think they are the same, think again. 5. Switzerland has a population of 7 million 997, including 1’864’699 immigrants. That’s a lot. 6. 10’000-25’000 is the number of Asylum seekers that Switzerland hosts per year. Mostly from Serbia, Croatia, Bosnia-Herzegovina and Sri Lanka according to KKF OCA. 7. People aren’t really racist, they have come a long way to acceptance in the idea that Switzerland is the best (most wanted) solution for a lot of people and they understand that. However you will rarely see different races in a gathering. 8. There is, of course, corruption, but you will not see it everyday. (or it is very well hidden) People still get freaked out about stuff like a cell phone robbery or the fact that your bike is gone. Even though on buses and trams they seldom check for tickets, they will get one. And if the mineral water is outside the store, a Swiss person will always carry it though the store and pay in the cashier for what he took. Morals are high and respectful at all times. 9. You will get well paid (minimum salary is CHF. 3400 – 3500 before taxes and insurance) and rewarded with at least 20 days paid vacation plus National Holidays. 10. You will also spend A LOT. On health Insurance, transport, taxes, food and rent, the last two being the highest. 10. Most Swiss people start working between 7 and 8 am and go home between 4-5 or 6 max. 11. You don’t have to dress a certain way, doctor’s work in crocs and technicians and young people in jeans. However, they will get mad if you misspelled or forgot a coma and your work isn’t pitch perfect. Switzerland is the land of precision, remember that. 12. If someone is in a suit, chances are they work in banking, government or an international company with HQ here. 13. Yes people are closed and cold. But they are also straightforward and will tell you if you are doing something wrong, shady or just fucked up. 14. If you arrive late to work people will give you “the look” and you will never do it again, but they respect illness and doctor appointments impressively (and people do take advantage of that). 15. Swiss people are very hard working, (time to eat is half an hour) and you will rarely see them chatting or taking time to get coffee or breakfast. Work is work. As a result, as soon as they leave the office their personal life begins and they disconnect. They work for their vacations and pension. 16. People go to the grocery store 3 – 4 times a week, eat healthy and go to the gym, hiking or practice a kind of sport or hobby. 17. Switzerland is not build for cars; gas is expensive, so is parking, insurance and maintenance and traffic can be crazy in cities, considering that it’s a very small country. 18. Yes, its true. You don’t have to prove your bank where your pay check comes from. The bank will only ask for you ID and an address. 19. Bread and cheese are essential in every Swiss household and the Bäckerei (Bakery) in the corner of the street is a gift from heaven. Each and everyone of them. In fact, when it’s your birthday you have to bring breakfast or a crossaint to everyone in the office. 21. In general, people are very outdoorsy. Swiss people travel a lot. They like to go hiking, swimming in lakes, running, and of course, skiing. 22. And before you realize you have never seen so many opportunities together in such a little piece of land. And Switzerland is starting to grow on you. Maybe, just maybe, taking a risk is worth it.